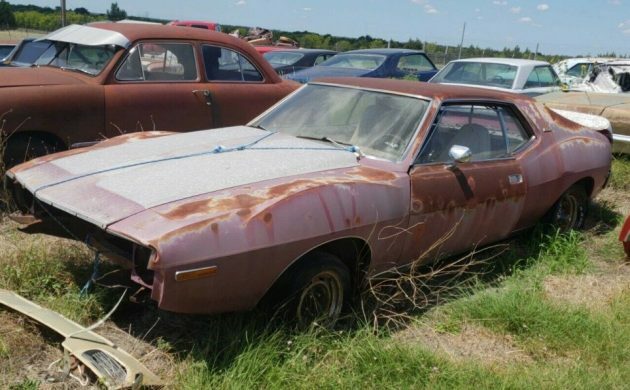 It isn’t clear how long this 1973 Javelin AMX has been sitting in this car graveyard, but I wouldn’t mind betting that it’s been a while. Even though sitting in an open field with long grass all around it isn’t the ideal storage environment, the fact that it is sitting in the dry Texas climate might be its saving grace. Whether it is or it isn’t could only be determined by personal inspection, because the photos don’t tell us a lot. 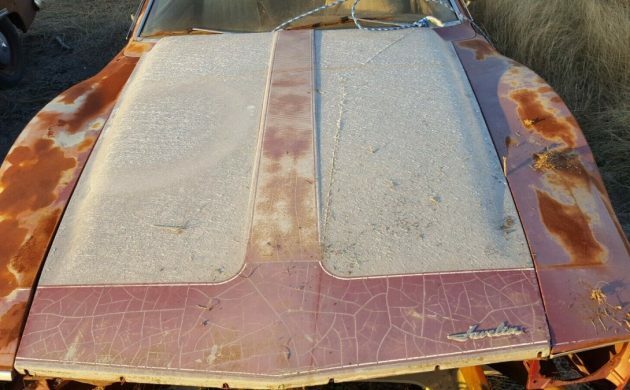 The Javelin is located in Nevada, Texas, and is listed for sale here on eBay. Bidding is currently sitting at $995 for the Javelin, but this is an auction with No Reserve. 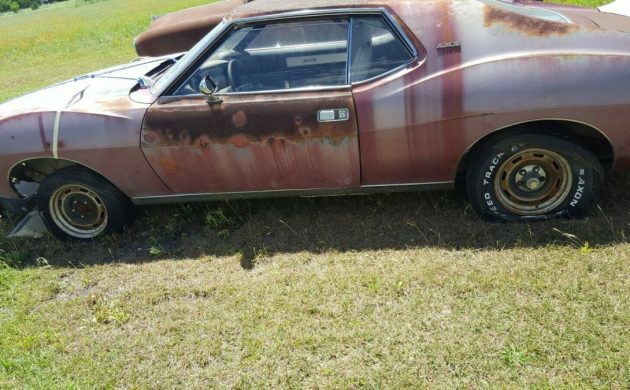 The owner says that the Javelin has some rust in the lower quarter panels, but it is hard to see how extensive this is in the supplied photos. He is unsure about the state of the floors, but he does say that there are a few items missing, such as the grille and its surround. Looking at the photos, my greatest concern rests with the alignment of the driver’s door. That has dropped quite substantially, and you’d really have to hope that this is due to worn hinges. Regardless, if the door has been sitting like that for an extended period of time, then it would allow moisture into the car if it rains, and that’s never good news. The hood is also looking pretty crazed, and that is going to require some work. We also don’t get a look at the interior of the car, so the best that I can tell you is that it’s white and that the instrument cluster and the floor console are both missing. You can be pretty sure that the harsh Texas sun won’t have done the interior trim any favors. We know that the Javelin was fitted with the 360ci V8 engine, the Torque-Command 3-speed automatic transmission, along with power disc brakes. The engine was supposedly pulled and rebuilt but has not been fired up since. It isn’t clear how long ago that was, but even if the motor is in good health, the photos suggest that the new owner is going to have a pretty long list of work ahead of them to get this one up and running again. I always try to look at the positive aspects of any car, and I can see that this would be a great car if it was to be restored. However, that dropped door is one aspect that is causing me a fair amount of concern. It raises the question as to whether this car is structurally solid, or whether it is hiding some nasty secrets. What do you think? I’d take it I had to 74 and it got stolen one of my favorite cars. if the guys throws in the eng and its rebuilt its a steal. Parts car maybe better. Not crazy about the 73 styling, but who knows?? Gotta be able to buy it right. Good luck to the new owner. Where the heck is Nevada Texas? No pics of the right side of the car. Rockers rot out along with the floor, but replacement panels are now available.. It looks pretty solid though here’s the thing, you have to remove the front clip to replace the door hinges. Theres a guy out there who rebuilds them. The door hinges aren’t as bad as it sounds. There are AMC reproduction sites that sell either rebuilt hinges or a hinge kit. I believe that people have also used similar pins from another make, I believe it’s GM. Either way, you just pop the old ones out and drill out the hole so that the new larger pins fit. The reason, by the way for the sag is the weight of the Javelin’s doors. They featured a safety “bar” which is literally a beam across the center of the door which makes these very heavy. Not if you want to do it right and not mess up your paint.I just did them on my 71. Had a really nice AZ car, a ’74 w/ 4 speed and A/C. It still rusted in the lower quarters, the trunks leak on these. This would be quite the project, but a nice car finished. Love those AMC products, but this one is too far gone for me! John s. Davis, after they stopped making the AMX in 1970 they rolled the amx name into the Javelin as a package. I restored a 1974 amx Javelin we picked up here in AZ in similar condition. Adam, have you ever been to Texas? Yes, there are areas where Texas is mostly dry. But if you ever lived in the Houston area, you would never say Texas was dry. The humidity there can be stifling for very long periods. However, the absence of road salt does help slow down the tin worm. Judging by the grass pictured I would say that Nevada Texas is somewhere in the “not so bad” humidity part however. I’m more interested in the Ford !